Puff puff. Another red light? Puff puff. Ooh, that was close. Almost ran over the broken glass. Puff puff puff. Wow, Boston is beautiful at this hour. Puff puff. Please, not another hill. Puff puff puff puff puff puff. But that downhill was AWESOME! Puff puff. Yikes! A dead snake. At least I didn’t kill it. Puff puff. Why is it when you’re biking the sun is always in your eyes but the wind never at your back? Puff puff. This is so cool. My boss, Emma Stanton, spearheaded the event. To say no would have been a bad career move. Bicycling is part of my family’s culture. My brother has biked for more than 40 years. My father did the Mt. Washington Bicycle Hillclimb at 80, my nephew at 16, both with my brother. My son has biked across the United States, the length of New Zealand and more. No outs from them. I’ve been an avid runner for almost 40 years. No out from a lack of fitness. So on Saturday, September 17, my coworkers Martin Smith (our leader), Jordi Cuervo, Sherrie Bieniek, and I left corporate headquarters at 7:54 a.m., with Chad Shirley at the helm of the safety vehicle. What unfolded in the next 82 miles was a reaffirmation of what I had already learned in life: challenges aren’t the ones you prepare for. This was an athletic group. Martin is a young former professional skier who spends a lot of time in outdoor pursuits. Jordi is a long-time avid bicyclist, and Sherrie is a triathlete. In spite of our obvious differences (age, gender, experience), it’s a group that hung together. The route was a fast-forward collage of urban and rural imagery: traffic lights, potholes, tree-shaded winding roads, filtered light. The hills seemed to go up more than down. We had to think all the time – anticipate the opening door of a parked car, the sand that could mean a spill, the cracks in the road that could grab a tire and vault us over our handlebars. The thinking was more exhausting than the biking. What unfolded in the next 82 miles was a reaffirmation of what I had already learned in life: challenges aren’t the ones you prepare for. It’s easy for me to write that now. The last half mile offered the worst uphill of the trip. My thighs burned, my heart pumped, my tongue hung out like an old Cocker Spaniel. But we made it, at 5:02. Lonny Madeux from our Connecticut office met us in Sterling to drive us back to Providence, RI where we took a 7:05 train back to Boston. I again hopped on my bike to ride the short distance to the parking garage, my 1967 San Francisco Summer of Love pants tucked up into my bike shorts underneath so I wouldn’t end up in a face plant on the Greenway. Back to challenges. I have the body mechanics for athletics; moving is my second nature. Athletics were, and still are, a familial culture. Yes, I could barely get up the stairs, I slept like a baby that night, but I recovered quickly because I trained and this kind of thing comes naturally. The reminder here is to celebrate not your proficiencies but the human spirit that overcomes difficulties or shortcomings. However, that’s not true for everybody. 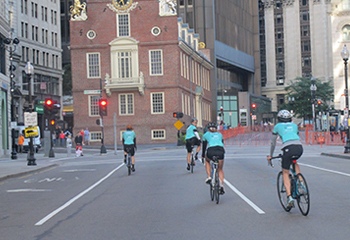 For those of you who smoke or carry a few extra pounds or prefer a day at the movies but are getting on a bike anyhow to participate in the Awesome Beacon Bike Ride – even if it’s just for 10 miles – I take my hat off to you. You’re out of your comfort zone – quite literally – to help Beacon Health Options make a 2,000-mile statement about mental illness. The reminder here is to celebrate not your proficiencies but the human spirit that overcomes difficulties or shortcomings. I think I need to spend more time doing just that. Maybe my next adventure will be a math course. I would just like to extend my congratulations, 82 miles on a bike I’m truly impressed. I love the way you wrote your blog “Puff Puff”. I’m happy you and you coworkers made it, and you all are safe. I know there were challenges however you were able to bike though the pain. You said you slept like a baby and it was well deserved. Again congratulations. Congrats to you all! I enjoy an occasional ride, but 82 miles I will leave to the professionals! On anther note, I am Boston born and raised and that pic of the Old State House warmed my heart; it is a reminder of class trips and days wandering Faneuil hall with friends…thanks for the happy stroll through memory lane.